To counter the biggest threat to software packages, they should be updated on a regular basis. Vulnerabilities are discovered on a daily basis, which also requires we monitor daily. Software patching takes time, especially when testing and reboots are needed. Fortunately, systems running Debian and Ubuntu can use unattended-upgrades to achieve automated patch management for security updates. With most software packages, unattended-upgrades has to be installed. If you are not logged in as the root user, use the sudo command to get temporary privileges. Since configuration is needed, we suggest to switch to root and install the package. The only exception is when you directly deploy your configuration with a tool like Ansible, Cfengine, Chef or Puppet. While the package is named unattended-upgrades, the actual script to perform the upgrade is named unattended-upgrade. To avoid confusion, unattended-upgrades (with s) is actually a symlink to the script. After installing, it is time to configure the package. Although there aren’t many things to configure, the configuration file is named /etc/apt/apt.conf.d/50unattended-upgrades. By default, only security upgrades will be installed, which is what most people want. Select that you want to have stable packages installed. First time when testing the package, use the -v parameter. This will the actions on screen. By default all actions are logged to /var/log/unattended-upgrades/unattended-upgrades.log. Information is also available per day, when actual upgrades are found and installed. In this case data is logged to the /var/log/unattended-upgrades directory, with a name similar to unattended-upgrades-dpkg_2015-03-09_18:17:39.573099.log. Log are rotated via the logrotate service. Usually no action is needed to ensure that the files are rotated as well. It is still advised to check /etc/logrotate.d/unattended-upgrades for more details and confirm things are properly configured. If you rather do it manually, use the file /var/run/reboot-required, to determine if a reboot is needed. Or if you want to know why a reboot is needed, check /var/run/reboot-required.pkgs. Often a reboot is needed due to updates to the Linux kernel, functions (libraries) or other software, which is integrated closely with the kernel. 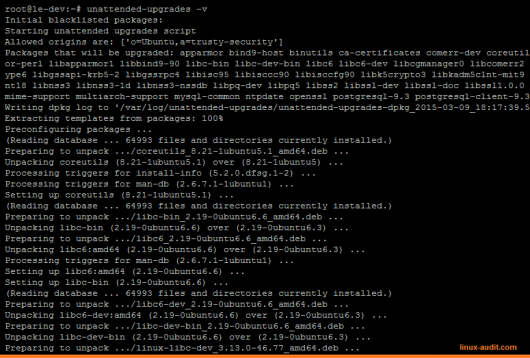 See our related blog post: how to check for a required reboot for Debian, Ubuntu, and others. 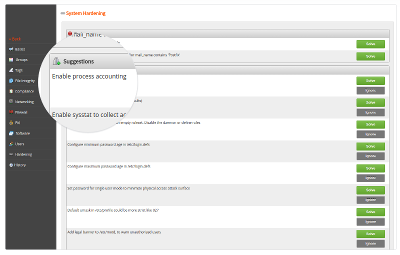 Configure your monitoring tool (e.g. Nagios) to monitor for the presence of /var/run/reboot-required.pkgs. If the file is available, then send out an alert. This way the system administrators know a reboot is needed and downtime can be planned. Additionally, monitor also for uptime. While Unix based systems are stable, it is not wise to let them run for a year. At least patch regularly and when a reboot is needed, to schedule it. It is better to “plan for failure” and ensure systems can be rebooted easily, knowing other systems take over functionality. Automation can fail. In other words: trust, but verify. Regularly auditing the configuration and proper functioning of the tool, is advised. Tools like Lynis can help with automating this audit process. 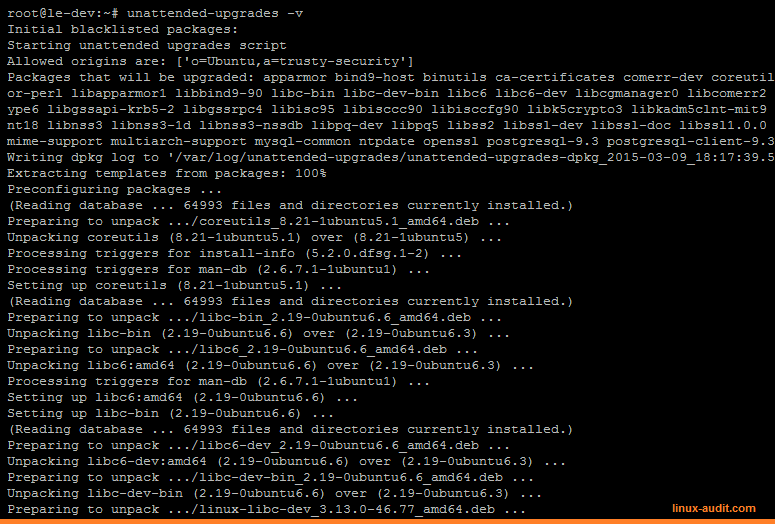 You should run sudo dpkg-reconfigure –priority=low unattended-upgrades to run automatically everyday. Thanks Francisco, it has been added to the article. Good catch!